Sir Francis Burdett, 8th Bt., (+), Ramsbury Manor, Wiltshire, sold Dreweatt Neate house sale, 21 May 1986, lot 77. 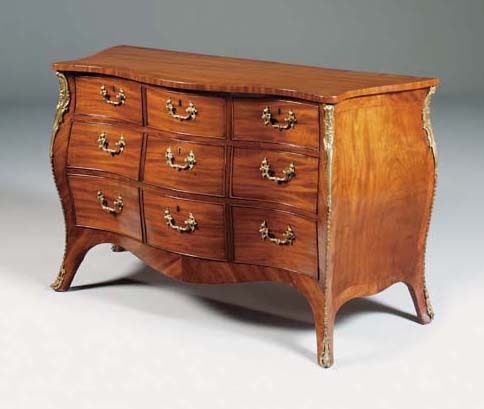 This beautiful mahogany commode is serpentined in the French 'picturesque' fashion that the artist William Hogarth taught at his St. Martin's Lane Academy, and lauded in his Analysis of Beauty of 1753. Thomas Chippendale (1718-1779) adopted a French chair for his St. Martin's Lane shop-sign and the majority of his furniture patterns in The Gentleman and Cabinet-Maker's Director, 1754-62 are conceived in this fashion. The commode is likely to have been commissioned by Sir Robert Burdett (1743-1797) for Foremark Hall, Derbyshire and supplied by Thomas Chippendale, who was employed at the house between 1766 and 1774 (A. Coleridge, 'Thomas Chippendale and Foremark Hall', Furniture History, 1997, pp. 136-142). The bombéd elegance of this commode is enhanced by a refined golden frame of flower-sprigged Roman acanthus, and the latter also derives from a French furniture mount used particularly by the ébéniste Joseph Baumhauer in the 1760s (see for comparison the bureau plat of c.1765, now in the Louvre, illustrated in A. Pradére, French Furniture Makers, London, 1989, p. 234, fig. 238). The façade of this commode chest of drawers is chequered with reed-framed tablets that frame 'picturesque' handles with embossed cartouches and Roman foliage. They relate to Chippendale patterns for brass work handles in the 3rd edition of his Director (1762) and feature on a commode with especially elaborate locks, that he supplied in about 1770 for Goldsborough Hall, Yorkshire (C. Gilbert, The Life and Work of Thomas Chippendale, Leeds, 1978, vol. II, figs. 226 and 270). Intriguingly, there is a group of similarly-mounted commodes associated with the emigrant cabinet-maker Pierre Langlois (d. 1767): a commode sold by the Trustees of the 5th Marquess of Hertford, Ragley Hall, Alcester, Warwickshire, in these Rooms, 30 June 1921, lot 25; another commode sold from the Parish Collection, Christie's New York, 29 September 1995, lot 205. The widespread use of a French mount may suggest a collaboration with a French bronzier working in London, such as Dominique Jean, whose proximity to Langlois on the Tottenham Court Road may suggest a possible collaboration. Thornton and Rieder's fifth article on Pierre Langlois discusses pieces possibly mistakenly attributed to Langlois. One of these, a bureau en pente commemorating the marriage of James, 2nd Earl of Waldegrave to Maria, illegitimate daughter of Sir Edward Walpole on 15 May 1759, is also mounted with 'Joseph'-style angle mounts. Related to this latter piece is the well-known commode from Corsham Court, supplied to Paul Methuen by John Cobb in 1772, which, although more compact, is constructed in a similar bombéd manner to the present piece (P. Thornton & W. Rieder, 'Pierre Langlois: Ebéniste, Part 5', Connoisseur, May 1972, pp. 30-35). Moreover, the Cobb connection with Foremark Hall is further strengthened by the fact that Cobb is recorded as supplying furniture to Sir Robert Burdett: in 1771 there is a payment to 'Mr Cobb for a japan tea tray for ye country' (Burdett papers, Wiltshire Record Office, Ref. 1883/196). The pair of commodes sold from the Collection of Samuel Messer, in these Rooms, 5 December 1991, lot 117 (£374,000) was similarly mounted at the angles with 'Joseph' mounts.